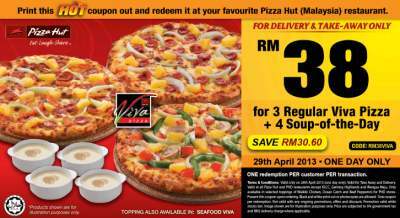 Pizza Hut HOT Coupon : 3 Regular Viva Pizza + 4 Soup-of-the-day at RM38 only! Location validity : All Pizza Hut and PHD restaurants except KLCC, Genting Highlands & Wangsa Maju. Only available in selected toppings of Waikiki Chicken, Ocean Catch and Beef Pepperoni for PHD stores. For Delivery & Take-away only. Valid for take away and delivery. Valid in all Pizza Hut & PHD restaurants except KLCC, Genting Highlands & Wangsa Maju. Present this coupon upon redemption/ordering. Photocopied, black & white printouts is allowed. Not valid with other promotions or discounts. SUbject to 6% government tax and RM2 delivery charge where applicable. LIKE & SHARE out this great offer from Pizza Hut!